We love bringing picture books to life through pretend play. 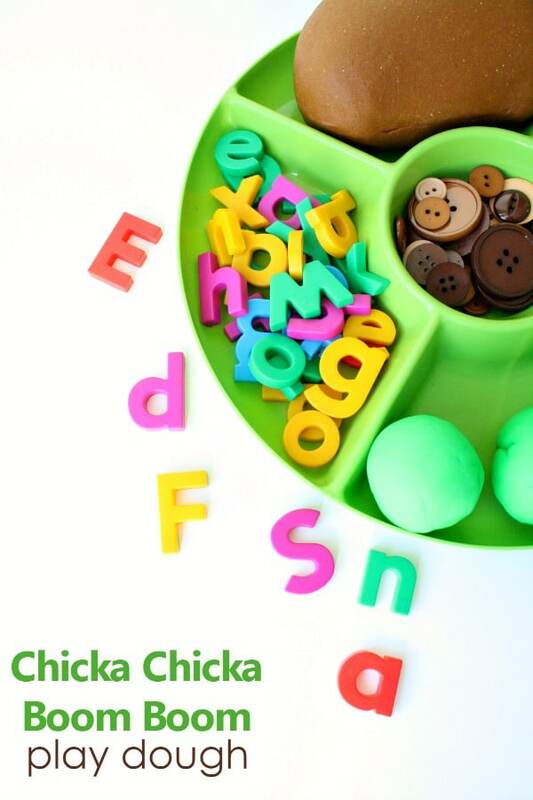 This play dough invitation is part of our Chicka Chicka Boom Boom lesson plans for home preschool and preschool classrooms. You only need a couple of materials to set it up. Kids love using the invitation to create their own Chicka Chicka trees and act out the story. You can also use the invitation for some guided alphabet and word building activities. Brown play dough-We made homemade play dough using our go-to play dough recipe and brown icing color. Green play dough-We used storebought for this invitation, because we had it on hand. 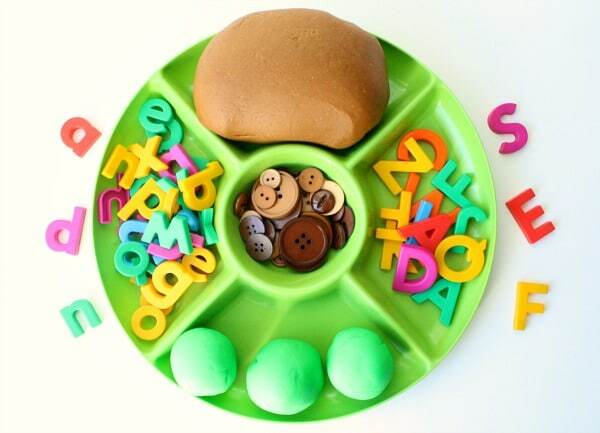 After reading the book together a couple of times set out this play dough invitation for kids to interact with freely. Let them create whatever they’d like as they explore the materials. They might create a palm tree, or they might create whatever is on their minds at the moment. Both options are perfectly acceptable. Read the story aloud and let your kids add and remove the letters as they appear in the story. Have your child place the letters in order from A to Z going up and down the tree trunk. Match upper and lowercase letters along the tree. Say a sound. Have your child find the corresponding letter and add it to the tree. 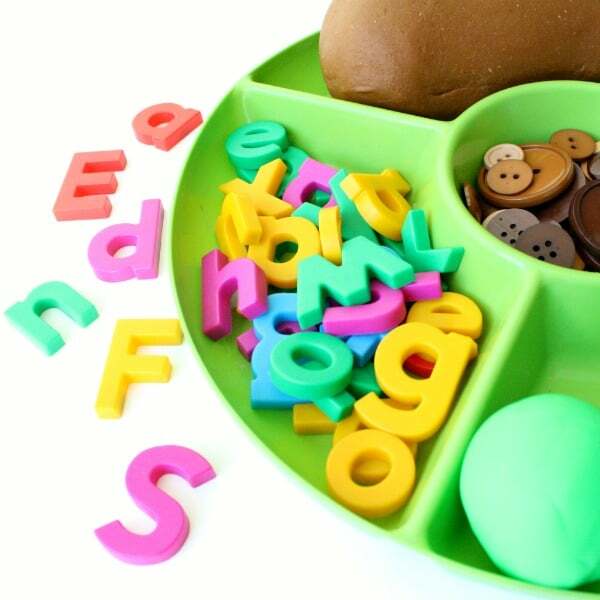 Say a CVC or spelling word and have your child use the magnetic letters to spell it along the tree trunk. Use the buttons to practice counting. Say a number (or use number cards) and have kids add the correct number of coconuts to the tree. Use the buttons to practice sorting. Have kids place buttons of the same size on different palm tree leaves. Use the buttons to practice patterning. Have kids place buttons in a pattern along the different palm tree leaves. 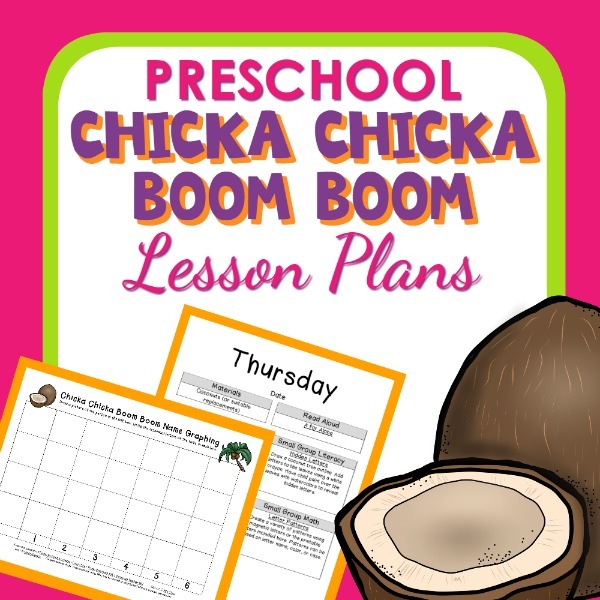 Continue learning with Chicka Chicka Boom Boom inspired activities in our printable lesson plan sets. Each set includes over 30 playful learning activities related to the theme, and we’ve provided different versions for home preschool families and classroom teachers so all activities are geared directly toward your needs.